Welcome Guest! Would you like to log yourself in? New Customer? Start here. Our insoles of cedar effectively get rid of foot-odour and counteract the formation of mycosis. The nature-own ethereal oils make this possible. Bacteria and micro-organisms, which cause a mold and a putrefaction are killed. So the cause of smell and athlete’s food in the humid climate of the shoes do not have a chance for spreading. Beyond that the finepored structure of cedar-wood sweat is absorbed. 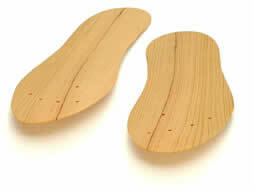 Insoles of cedar are ultra-light, extremely fine, confortable to wear with socks, nylons or bare-footed. Some fissures at the kinks after short-time wearing is unavoidable and absolutely normal due to the structure of the wood. This is not an impairment of its effectiveness nor in the wearing comfort. We suggest you use two or three pairs of insoles at a time to avoid constantly changing your insole from one pair of shoes to another and to let your natural your insoles recover. From the first day you will assert the comfort of the insoles of cedar. Ultra-light and flexible it already adapts to the form of your foot after few steps. The anti-slide coating provides for safty from sliding in each shoe. Together with the pleasantly smooth surface that results in highest comfort, even without socks or nylons. The distinctive feature of our cinnamon sandals is the natural material of its foot bed. It consists of air-permeable fibres, named loofah, well-known for its pleasant massage effects. Filled with cinnamon, they provide continuous freshness and a comfortable scent. The surface material is of natural components: cotton and jute. The sole is made of natural black caoutchouc. 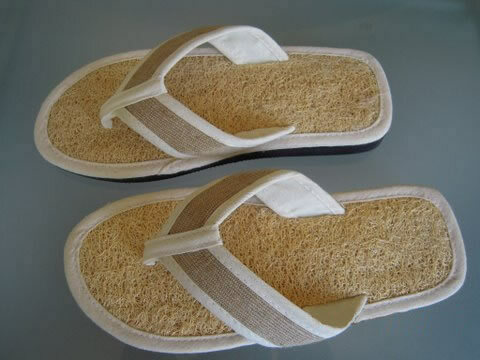 Cinnamon sandals are suitable not only as pleasant summer-shoes, but also as comfortable slippers. Cinnamon sandals do not only help fight foot odours, but will also help you to make it through the day in a most comfortable way, especially if you are on your feet all day long. You will quickly feel the comfort, our cinnamon sandals provide you with, and you will not want to miss them! The special feature of our cinnamon insoles are that they are cotton covered and made of loofah fibres which contain cinnamon powder. Cinnamon is renowned for its excellent humidity absorbing qualities and the pleasant natural scent it diffuses. Cinnamon insoles take on the form of your feet and shoes, therefore you should reserve a pair of insoles for each pair of your shoes. If your feet sweat excessively, just remove the insoles 1 - 2 times weekly to allow them to dry overnight. Should you wish to wear the insoles in your slippers, the simply stick a double-sided adhesive tape under the insoles to stick them in the slippers. Cinnamon insoles do not only help fight foot odours, but will also help you to make it through the day in a most comfortable way, especially if you are on your feet all day long. You will quickly feel the comfort, our cinnamon insoles provide you with, and you will not want to miss them! The distinctive feature of our cinnamon thongs is the natural material of its foot bed. It consists of air-permeable fibres, named loofah, well-known for its pleasant massage effects. Filled with cinnamon, they provide continuous freshness and a comfortable scent. Cinnamon thongs do not only help fight foot odours, but will also help you to make it through the day in a most comfortable way, especially if you are on your feet all day long. You will quickly feel the comfort, our cinnamon thongs provide you with, and you will not want to miss them!